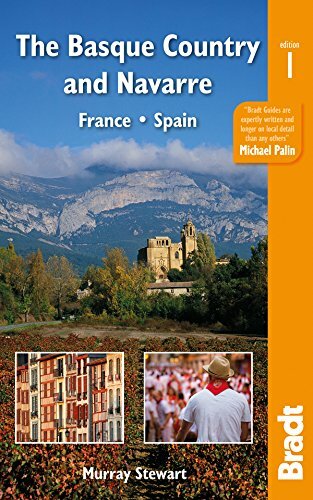 In this, the most complete guidebook to the Spanish and French Basque Country and Navarre, Murray Stewart covers the principal cities - rejuvenated Bilbao, beautiful San Sebastián, verdant Vitoria and lively Pamplona ---- and also delves deeper into the region's interior, capturing the quirkiness that make it so special. With 35 maps, 16 walks, advice on where to cycle, horse-ride and surf, he guides travellers through an area whose profile is firmly 'on the up.' Find the best pintxos (Basque tapas), the finest chuletón (beef chop) and the freshest fish. From elegant Biarritz, via the French Basque Pyrénées, to the Navarran 'badlands' of Bardenas Reales, we take you to fascinating, less-visited places. Here are the best festivals, including Pamplona's famous, bull-running Sanfermines. Learn how the handing-over of three cows has kept the peace for centuries, or where you can see the annual 'Benediction of the Red Pepper'. Join the walkers on the Caminos de Santiago, the pilgrim routes which still sustain the local economy, 1,000 years after they began. Find information on the unique Basque and Navarran wines, top birdwatching sites, history, music, sports and culture ---- and when to visit.